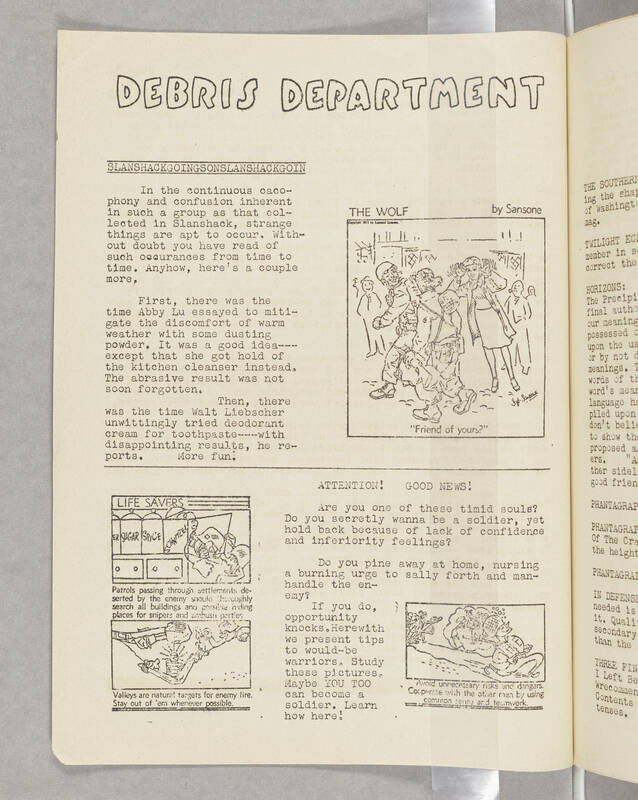 DEBRIS DEPARTMENT [[illustration text top]] THE WOLF by Sansone "Friend of yours?" [[end illustration text]] [[illustration text bottom]] LIFE SAVER Sugar Spice Schnitzel Patrols passing through settlements deserted by the enemy should thoroughly search all buildings and possible hiding places for snipers and ambush parties Valleys are natural targets for enemy fire. Stay out of 'em whenever possible. Avoid unnecessary risks and dangers. Cooperate with the other men by using common sense and teamwork. [[end illustration text bottom]] In the continuous cacophony and confusion inherent in such a group as that collected in Slanshack, strange things are apt to occur. Without a doubt you have read of such occurances from time to time. Anyhow, here's a couple more. First, there was the time Abby Lu essayed to mitigate the discomfort of warm weather with some dusting powder. It was a good idea--- except that she got hold of the kitchen cleanser instead. The abrasive result was not soon forgotten. Then, there was the time Walt Liebscher unwittingly tried deodorant cream for toothpaste---with disappointing results, he reports. More fun! ATTENTION! GOOD NEWS! Are you one of these timid souls? Do you secretly wanna be a soldier, yet hold back because of lack of confidence and inferiority feelings? Do you pine away at home, nursing a burning urge to sally forth and man-handle the enemy? If you do, opportunity knocks.Herewith we present tips to would-be warriors. Study these pictures. Maybe YOU TOO can become a soldier. Learn how here!